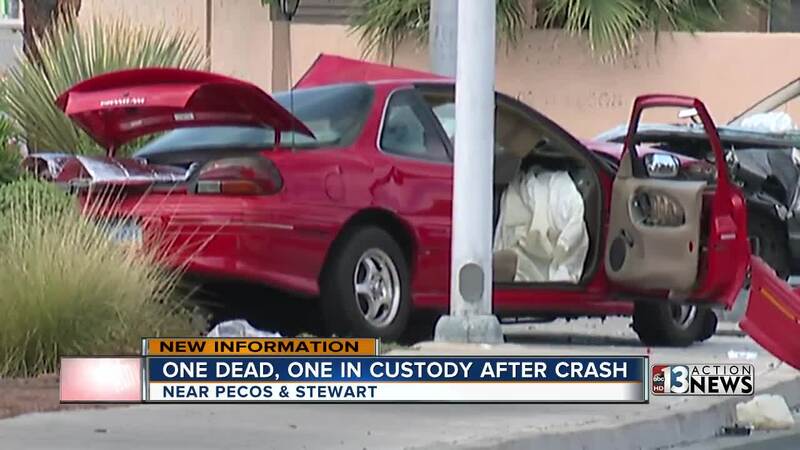 One person is dead and another was arrested after a deadly crash near Pecos Road and Stewart Avenue. 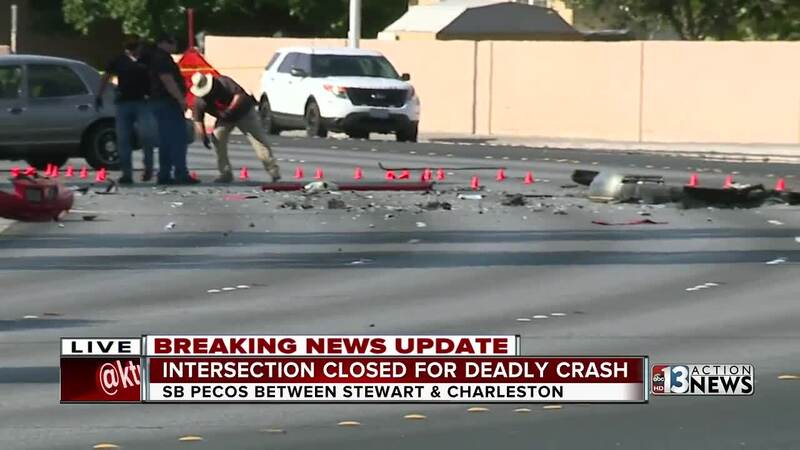 One person is dead and another is in custody after a deadly crash near Pecos Road and Stewart Avenue around 2:23 p.m. Sunday. Pecos Road closed in both directions between Stewart and Sunrise avenues while police investigated the crash. Preliminary information indicates that the suspect's vehicle was heading northbound along Pecos Road too fast and crashed into another car. The driver in the other car was pronounced dead after being rushed to the hospital. Police arrested the suspect at the scene. They believe that speed was a factor in the crash and that the suspect was driving under the influence. Neighbors who live in the area said that the stretch of road where the crash took place is particularly dangerous. Police say that drivers really need to be careful in their neighborhoods, stating that it boils down to a community issue. "This is the second time this weekend we have been out for a fatality and the third in the last 48 hours for a serious collision," said Captain Nick Farese with the Las Vegas Metropolitan Police Department. "We need the community to take ownership of it." The suspect, identified as 36-year-old Williams Jones, has been booked into the Clark County Detention Center. A passenger in his car left the scene of the crash before police arrived. This marks the 72nd traffic-related fatality under the Las Vegas Metropolitan Police Department's jurisdiction for 2018. Correction: Initial reports from police stated that four vehicles were involved in this crash. However, new information shows that there were actually two vehicles involved.